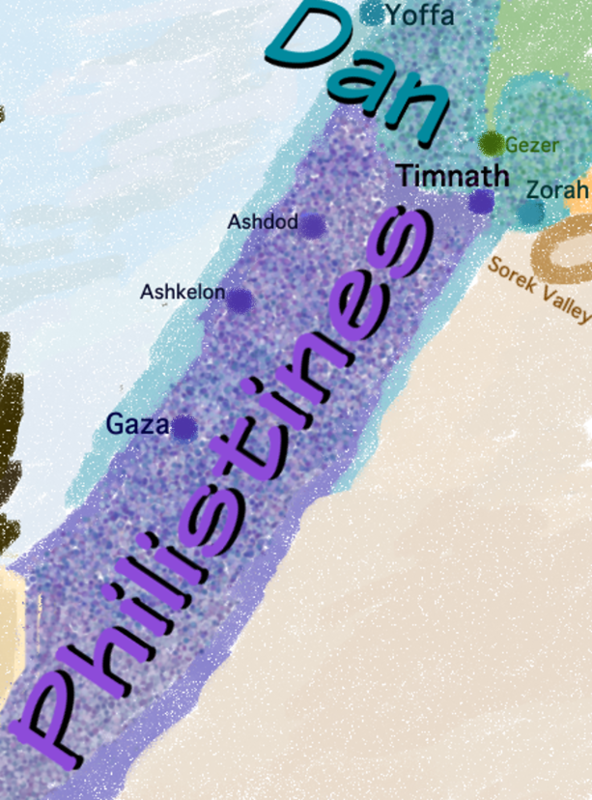 Notes: See a close up of my Samson-tribal territory map (created with info and map from this post). I was especially interested in the “iron chariots” mentioned. This is the early Iron Age but the Israelites don’t yet have chariots nor much iron. The Israelites are always more of a spiritual power not great warriors, and are outgunned by many of the other regional ethnic groups. And when they backslide and go astray per usual, serving golden calfim and Baalim and other Canaanite gods, they’re easily absorbed into the local culture, assimilate, and vanish. The Central and Northern tribes seem to never even begin conquering and forcing locals out, the superior technology of the those peoples (i.e. iron chariots) being such a deterrent. The excellent, highly useful commentary from 1872 (public domain) A Commentary on the Holy Scriptures: Joshua, Judges, Ruth By Johann Peter Lange, notes on page 39, “…but when it came to a contest with iron chariots their faith failed them.” Iron chariots are “a nice tall glass of NOPE,” similar to Godzilla’s reaction to giant hornets in The Oatmeal‘s comic about running. By the time Chapter 13 (Samson) comes ’round, the tribe of Dan is reduced to a mountain corner of their allotment, thoroughly dominated, tributaried, “ruled over” by the powerful Philistines. Samson is a Danite trying to dislodge the Philistines from Dan’s claim. See this map and my map. In this and other Biblical accounts of the early Israelites, primitive monotheism or henotheism, the belief in one national God superior to all others but not the only deity in existence, is implied. Military victory over competing cultures gives the god of Israel cred at the expense of other gods. “No god but God” developed later. The Danites having no military capability to resist the Philistines, Samson decides to instigate antagonistic domestic relationships with them. Chabad says: “He decided that he would avenge himself upon the Philistines by engaging them in personal conflicts, and intimidating them, so that they would no longer molest his brethren.” This is odd. According to commentaries, Samson is motivated both by lust and scheming to help his underdog tribe (Dan) and people (Israelites). He’s an intensely flawed hero. I pictured Samson CHARGING out of the womb already ripped. One built infant. I picture Samson dreaming of the woman from Timnath, here more demonic phantasm than human. 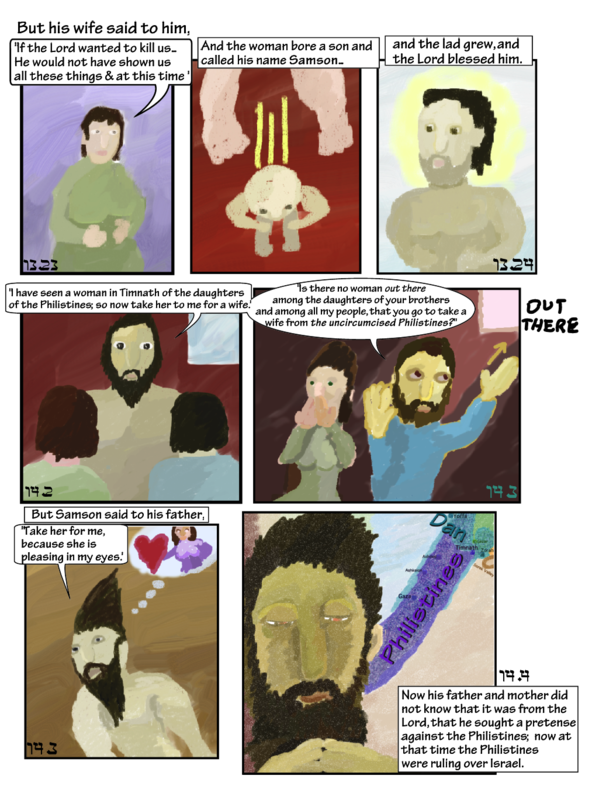 Panel 7: 14.4: Now his father and mother did not know that it was from the Lord, that he sought a pretense against the Philistines; now at that time the Philistines were ruling over Israel. Samson schemes with plotting-pose fingertips touching. Behind him, the pertinent tribal land allotments, but the Philistines controlling the bulk of the Danites’ allotment along the Mediterranean coast.